Perhaps the most interesting role belongs to Yuna, the game’s female lead. 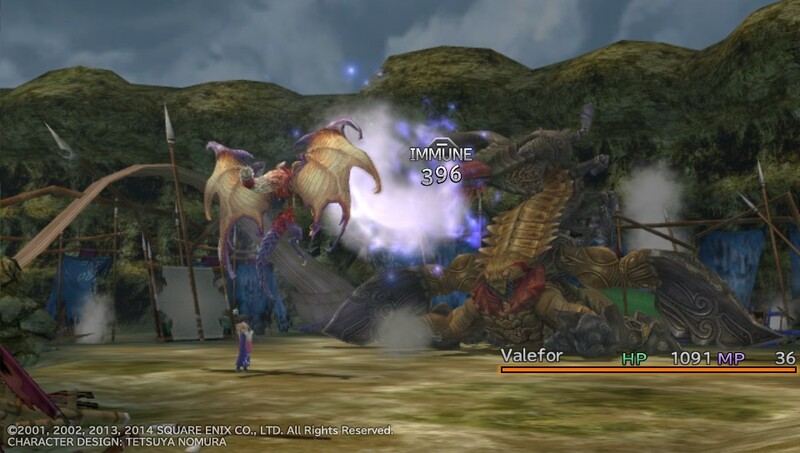 By default she is the party’s healer, but she can also summon vast, powerful beasts such as Valefor in the above screenshot – a mechanic that’s both clever and spectacular. The key is that summoning is an interesting decision, not an “I win” button: Valefor and her kin can inflict terrifying damage (especially once their special attacks charge up), but they’re also vulnerable to being swarmed, tricky to heal, and if KO’d, will be unavailable until the next save point. When is the right time to call in your glass cannons? And once they are on the field, should you charge up their specials more quickly, at the cost of weakening their defence? Amidst my general praise, I do have two caveats. The first is that FFX still uses the traditional, outdated JRPG system of random encounters, although this is not as bad as it could be. The battles are enjoyable for once, and paradoxically, I suspect that the game’s linearity helps – with less scope to run around and explore, being interrupted by random battles becomes less irritating. My second caveat is that characters don’t level up unless they participate in battle, and this drags out fights as I call in unneeded party members – it would have been better to grant experience to every character, regardless of participation. Still, these flaws are relatively minor compared to what FFX does right. Square Enix delivered a system that was both simple and satisfying – battles are a happy rhythm filling the space between plot sequences, not the “tax” I have to pay before I find out what happens next. I look forward to playing through many more before I finish. (1) For once, status effects are useful. For instance, poison is effective against high-HP monsters (and high-HP party members! ), while darkness counters powerful melee monsters. (2) An option Final Fantasy VIII really could have used.